In the summer of 2016, we were lucky enough to have an Intern work with us from the Excel Southampton Internship Programme at the University of Southampton. Having graduated from The University of Southampton this summer, I was lucky enough to gain a placement based at the New Forest Centre in Lyndhurst. 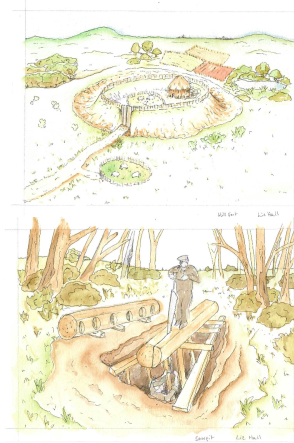 I worked with the New Forest Knowledge’ project, which is one of a variety of projects that are part of the ‘Our Past, Our Future’ landscape partnership scheme. This project is focused on digitising the collections of information and material held about The New Forest in order to make this accessible online to a wide audience of viewers from many different backgrounds and professions. The majority of my time was spent on the drawing and design of a new logo for the New Forest Knowledge project, producing illustrative documents to ensure the continuity of the project’s visual identity and other creative tasks that cropped up along the way. As a Graphic design, Illustrator, and Photographer Intern and otherwise all-purpose creative person for the project, my main priority was to get the ball rolling on how the new logo might look. Working from predefined boundaries and guides of what I needed to incorporate into the design, I came up with a variety of different possibilities. In discussion with the team, the design below was picked as our initial favourite. This idea incorporates multiple thoughts we had about how the logo should look, and we felt it may present a more modern and academic focus. The design still uses the integral tree visual, used in the New Forest Centre logo, as the basis of the design; however, these branches shape themselves into the form of a brain. This uses some of the desired themes we aimed to illustrate within the logo design involving knowledge and learning as well as nature. The graphic itself has the potential to be eye-catching and thought provoking, whilst still maintaining a classic and simple aesthetic. I created different variations of this design, seen below. The version below left shows a thicker more rounded design of the ‘brain tree’ which is perhaps a bolder and more defined variation of the original version. I also drafted a version that included horses, to show a closer link to the original New Forest Centre logo. A final design will be produced following discussion with the rest of the team. Using the currently preferred draft for the logo design, I created a graphic to be used for the new display, aiming to inform and explain to the public what the project is about. The graphic aims to catch the eye of passers-by and spark their interest, bringing them in to read and learn about the project. The words emerging from the roots (Share, Research, Future, Community, Preserve, Heritage, Nature, Inspire) are key aims and aspects of the project, and will correspond to other materials included in the display. I also spent a week working with members of the New Forest Knowledge team at The National Park Authority in Lymington. The work carried out here was to be used both on the New Forest Knowledge website and for a booklet, giving information on important archaeological sites and showing how and why it is important to preserve and maintain these monuments. I created simple, understandable watercolour and ink illustrations to show the most common sites that occur in and around The New Forest. These illustrations show reconstructions of the archaeological sites and how they might have looked when they were in use. The hope is that in viewing these reconstructions it will enable people to visualise their initial appearance and therefore understand the importance of the sites in question. The Centre has been a great environment to work in. Working mainly in the Christopher Tower New Forest Reference library, I have been surrounded by information both old and new, and by colleagues and volunteers who are excited and knowledgeable about the work that is happening and that lies ahead with this project. The wonderful team both at the New Forest Centre and The New Forest Park Authority offices have made me feel very welcome, and it has been a pleasure to work alongside such an enthusiastic and friendly group of people.